The Solar Whiz gable mounted fan provides a simple yet highly effective solution to sub-floor ventilation issues. 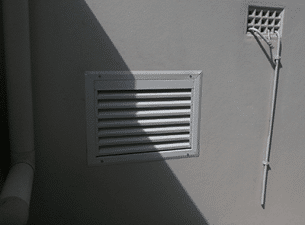 This large capacity fan is mounted on the exterior wall of the sub-floor and can move from 1600 to 4000 cubic meters of air per hour. 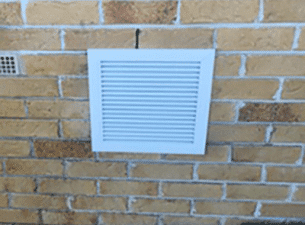 The Solar Whiz draws in fresh, dry air through wall vents and expels it through the sub-floor area effectively drawing out the moisture and expelling it outside the under floor area. 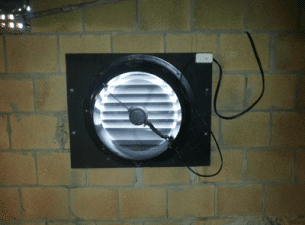 If the area in the sub-floor is restricted and won’t allow the system to be installed, we offer an alternative 150mm diameter solar fan. The traditional sub-floor ventilation system focuses on expelling moisture from underfloor areas by using extraction fans. Solar Air collector systems apply a unique approach that involves using solar air collectors to heat up and deliver fresh, humidity free air into the problem areas. On a sunny day a solar air collector can deliver fresh heats air with a humidity content of less than 10% during a significant part of the day. The "Wall Integrated" Solar Whiz sub-floor fan is a cost effective approach for creating cross flow ventilation in sub-floor areas. The Solar Whiz sub-floor fan is whisper quiet and has no power consumption.